Was he among the thousands kicked out of the military instead of getting help they needed to heal from combat? He joined the Puerto Rico National Guard in December 2007, and served in Iraq from April 2010 to February 2011 as a combat engineer, according to the Alaska National Guard. He was in the Army Reserves before joining the Alaska National Guard two years ago and got a general discharge Aug. 16, 2016, for unsatisfactory performance, a spokesman for the Alaska guard said. He was a private first class when he was discharged, the Guard said. Santiago tried to get help and was clearly in distress. In November, Santiago walked into the FBI's office in Anchorage and claimed his mind was being controlled by a U.S. intelligence agency and the CIA was forcing him to watch ISIS videos, federal law enforcement officials told NBC News. Santiago was clear that he didn't intend to harm anyone, but the FBI was concerned by his erratic behavior and called police and he was taken to a mental health facility for an evaluation, FBI Special Agent in Charge George Piro of the Miami division told reporters Friday night. 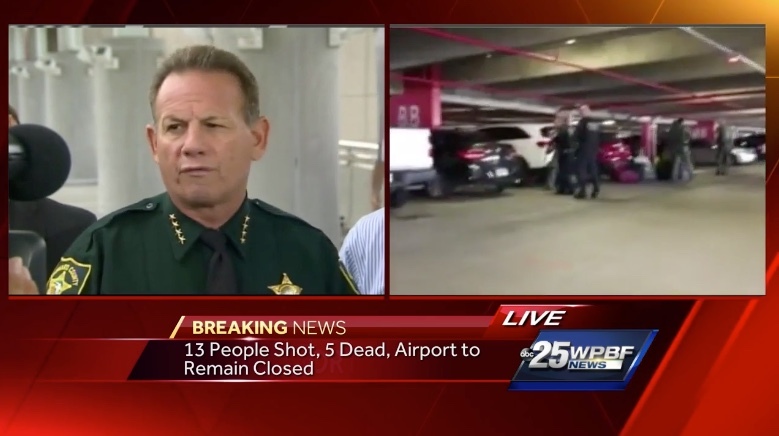 An arriving airline passenger with a gun in his luggage opened fire in the baggage claim area at the Fort Lauderdale airport Friday, killing five people and wounding eight before throwing his weapon down and lying spread-eagle on the ground, authorities and witnesses said. The gunman — identified by authorities as 26-year-old Esteban Santiago, of Anchorage, Alaska, an Army National Guard veteran who served in Iraq — was immediately taken into custody. His brother said he had been receiving psychological treatment recently. The attack sent panicked passengers running out of the terminal and onto the tarmac, baggage in hand, and forced the shutdown of the entire airport. Authorities said the motive was under investigation.